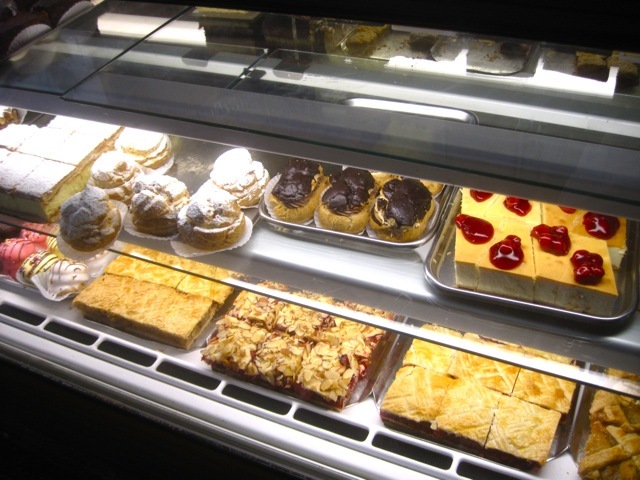 I am sure that I can’t write anything original about the Morningside Heights landmark Hungarian Pastry Shop, but if you don’t know the hood, you should be aware of this bakery. I don’t know how long it has been in existence, although it must be at least 60 years, and it definitely has that old world, kinda-seedy-in-a-good-way NYC feel. It’s a Columbia U hangout and its tables have experienced hundreds of thousands term papers, intellectual conversations, and Sunday Times. It’s always packed, but still chill. The Hungarian name only shows up in its baked goods selections. My favorite is the classic strudel, particularly cherry, but the apple and other flavors are all good. The baklava also gets high marks. 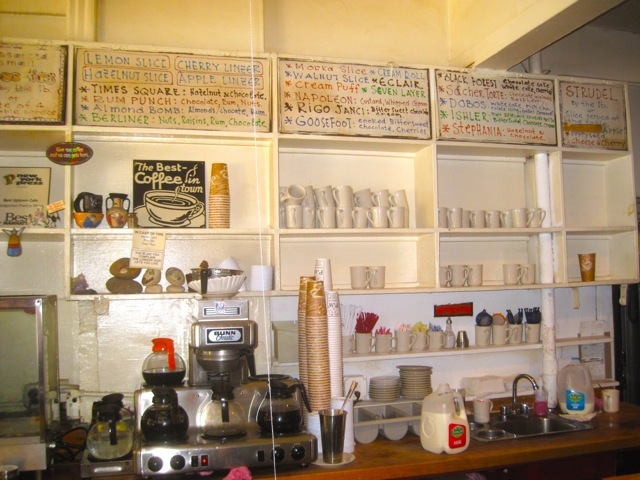 There is nothing fancy here, mostly good cookies and pastries, and the coffee is average, but the classic vibe is worth the trip. There are just not many of these places left anymore. 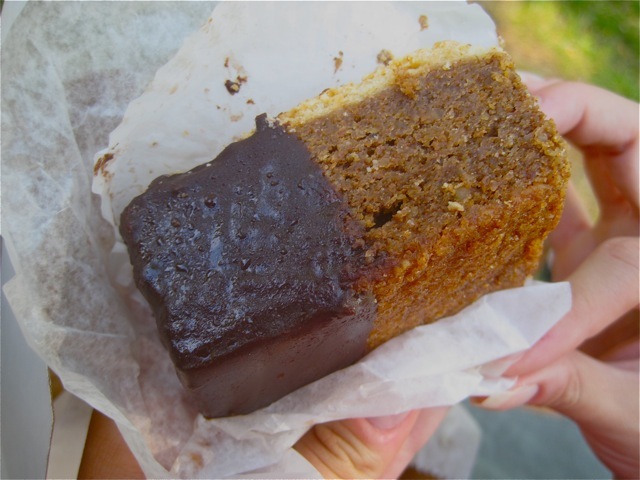 Plus, St, John’s the Divine across the street adds a bonus cultural destination when you finish your strudel. Their tagline says it all. The place is a modern/classic oxymoron, that somehow works quite well. Lansky’s has only been open for about a year, but somehow seems classic. I’m not talking Katz’s classic, but it has done a nice job of making a cozy pub-like decor, while still offering a flat-screen tv and good soundtrack – we heard some Bowie tunes. They serve the requisite garlicky pickles and creamy coleslaw as complimentary starters. We split the “Coney Island Knishwich”, and along with our Dr. Brown’s, it was a tasty, filling lunch. This dastardly creation is a large potato knish cut in half with one side corned beef, the other pastrami, both topped with muenster cheese, coleslaw and Russian dressing. It is genius really. 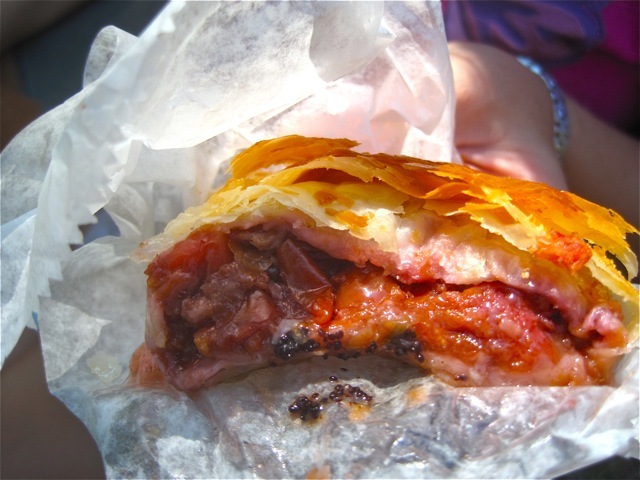 At a Jewish deli, I always want a knish and a sandwich – now I have both and the whole thing just melts in your mouth. They have a wide variety of soups, sandwiches, special “Devil Dogs”, and everything else one desires from solid Jewish fare. Check it out, it’s a lot tastier than temple! 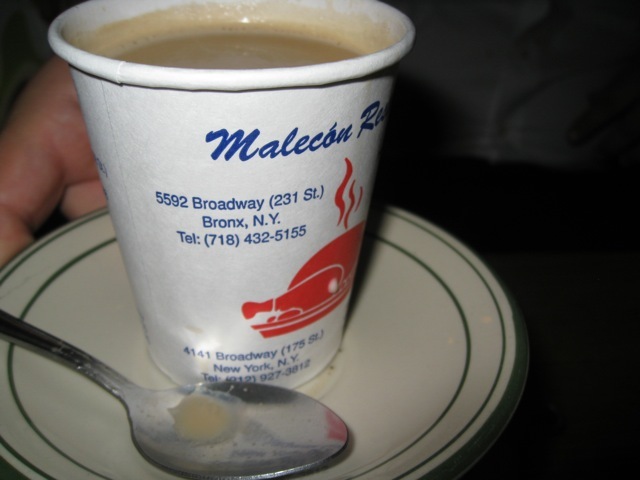 I used to live 6 blocks from Malecon and passed it every single day for years, but never tried it. I heard many good things about it, but for some reason never got there. Now, almost 4 years later, I finally got there, thanks to Mr. Headphones, and was not at all disappointed. 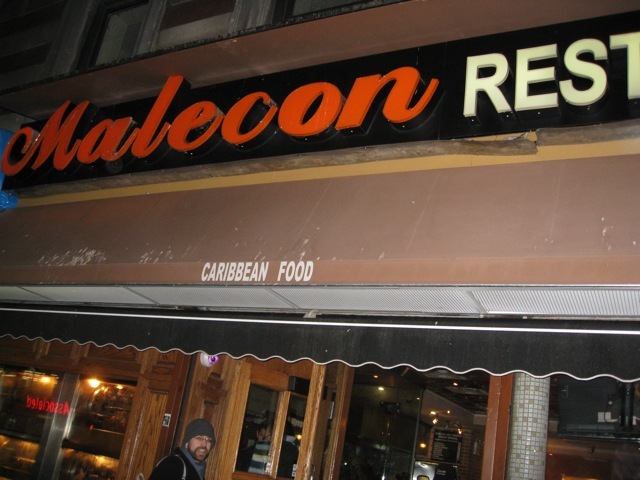 Malecon reeks of authenticity. It has all the tell-tale signs: minimal decor, staff with broken English, and a no frills menu with loosely-translated English. The portions are enormous. 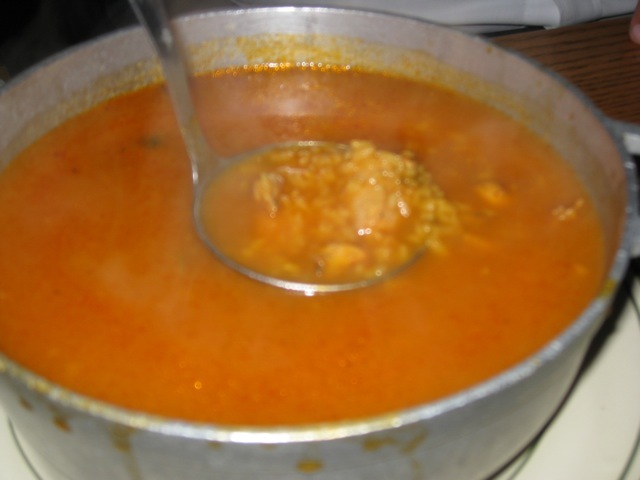 We had the sensational soupy rice with chicken that arrives in a large bubbling cauldron of goodness. It was a cold day, so the bowl after bowl of soothing chicken and rice soup warmed our bellies. The large mound of mofongo was equally tasty as the mild mashed plantains bonded with chicken and garlic. 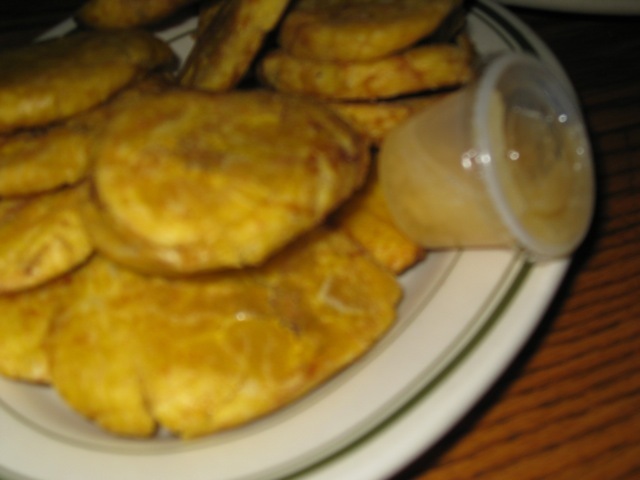 Of course we had to have yuca and tostones (both good) to round out the experience. I usually do not eat desserts at this type of ethnic eatery, as they are usually flan or basic ice creams, but the two we tried were great. 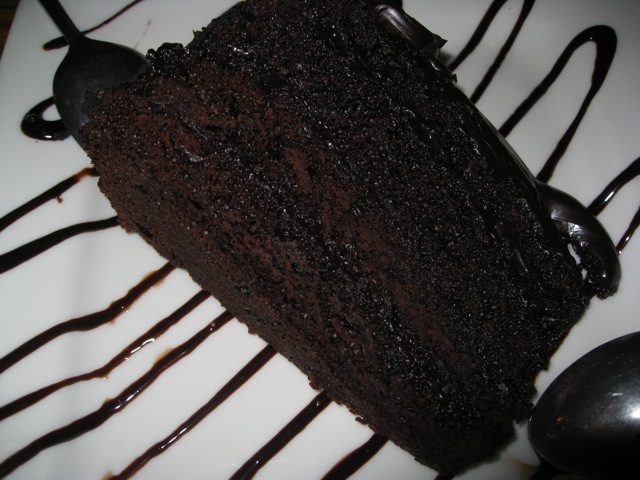 The chocolate cake was good, standard cake that was not dry and had a good ratio of cake to icing. 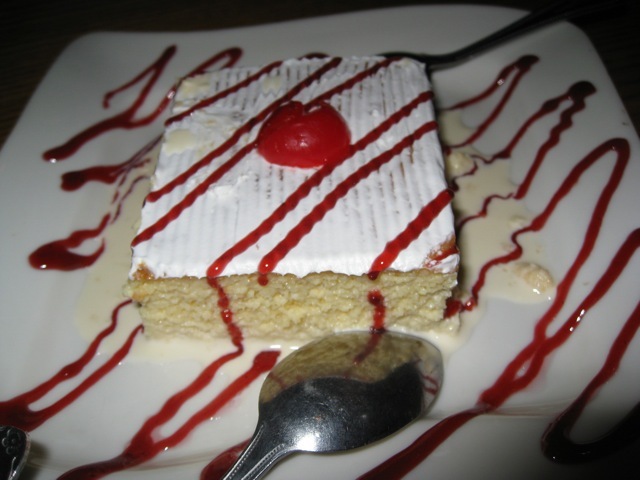 The tres leches cake was outstanding however. It was super moist with the creaminess almost overpowering the cake, yet still retaining its form. It was fantastic, and I was already plenty stuffed from our other dishes. The moral here is not to overlook those neighborhood places that you pass by daily. You might find a mofongo in the rough. After a week I am already longing for a return visit to Malecon and all its deliciousness, so I know it deserves a big fat golden bonzone. Yes, I have suffered from all kinds of “belly” ailments……they result from eating large portions of amazingly perfected foods, and believe it or not, I am quite picky about what foods I eat copious amounts of…..for example, I have suffered from “nut belly”, “pie belly (savory)” and “potato belly” (what gal named “Spud” wouldn’t have?) 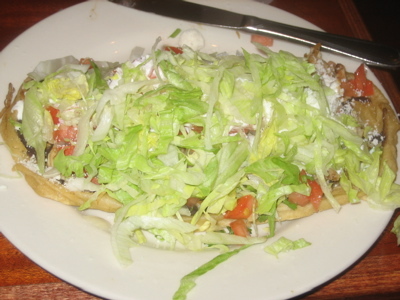 and last Friday night, I succumbed to “Nacho Belly” at Noche Mexicana…….my *favorite* Mexican Restaurant for now! It fits all of the requirements of a Grub Hub Golden Bonzone contender. It is scarcely decorated, unassuming, incredibly authentic and dirt cheap! Run, run, run to the border……the Noche Mexicana Border, that is! 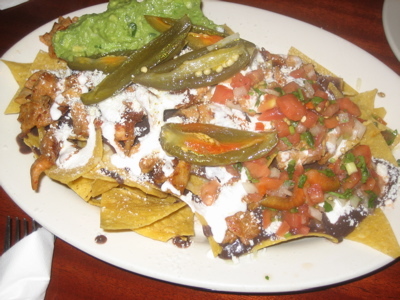 The three of us devoured the large platter of perfectly proportioned Spicy Chicken Nachos. The chips were recently fried and crispy and warm, the chicken seasoned and spicy, the guacamole given on top substantial and hearty and super-yummy and the pickled jalapeno slices plentiful and just given for the right amount of kick! 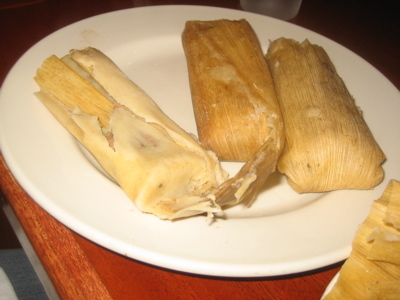 I was quite satisfied with my order of tamales…..the were salty and filled with rich cornmeal and there was plenty of pork in the center. They were delicious and I was given three for $5. Unbelievable deal! 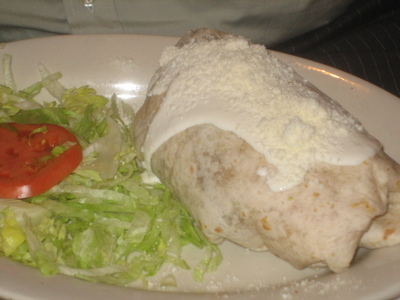 Mr. Headphones had a shrimp burrito that was loaded with really nice sized shrimp, not the usual tiny ones you’d expect, and the Hubs had huaraches, which is kind of like a Mexican pizza with a deep fried dough on the bottom and loaded with lettuce, chicken, tomatoes and sour cream. We were so satisfied and insanely full with authentic Mexican flavors. We will definitely be returning. I don’t think that I have seen a bill for $30 for three people in the longest time!! Granted, we didn’t drink, but they offer full bottles of wine for $15, so we might the next time. Check this place out, you will not be disappointed! 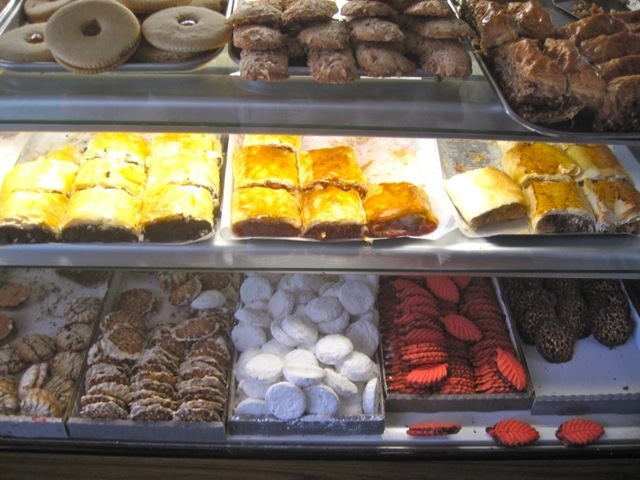 Afterwards, we stayed on the Westside and traveled down to the famed Cafe Lalo for dessert. 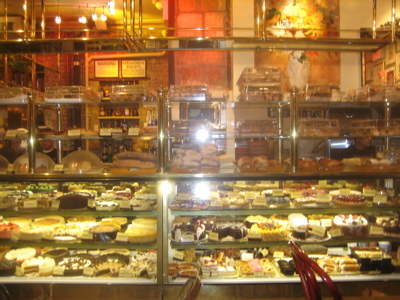 The cafe has dinner items, but is mainly known for its dizzying display of desserts. 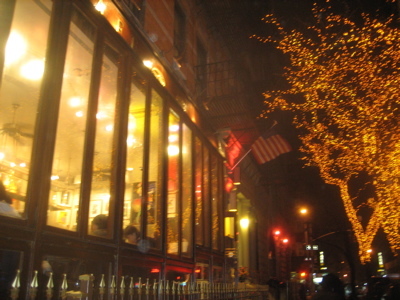 It is widely known as a prominent setting in You’ve Got Mail and is always packed with locals and tourists. 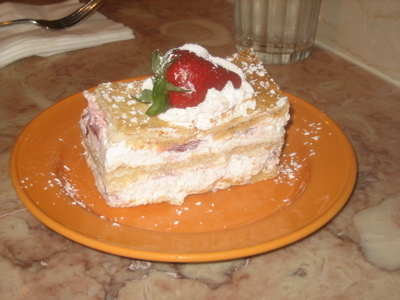 We enjoyed a strawberry Napoleon, peanut butter chocolate mousse cake, and cherry pie.